IT Best Practices: Intel IT is standardizing on Windows 8 as the primary operating system for business Ultrabook devices and Intel architecture-based tablets. We are accelerating the deployment readiness for business Ultrabook devices and tablets, and intend to make the new OS available for laptop and desktop PCs. Our plan is based on six months of extensive analysis and testing of Windows 8, including a pilot of over 300 users. 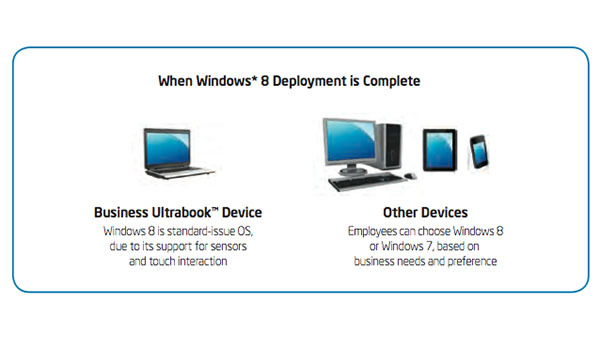 Listen to the Inside IT: Deploying Microsoft Windows 8 in the Enterprise podcast. Intel.com, LinkedIn, or follow her on Twitter.